While VR promises to take gamers to another world, AR has the potential to bring the game elements into your own neighborhood or home. 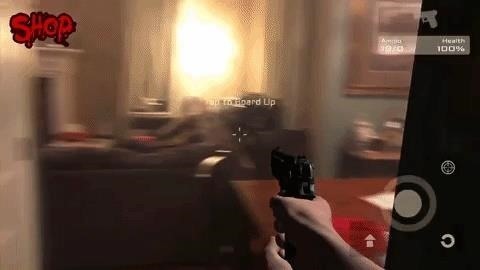 Just in time for Halloween, ARZombi places your living room into the epicenter of a zombie outbreak, with your ARKit-compatible iPhone or iPad acting as your eyes and your weapon. The game, which we reported on previously, is now available in the App Store. It uses ARKit to establish the floor's location, players mark the openings of the front door and windows to the left, right, and rear walls of the room. 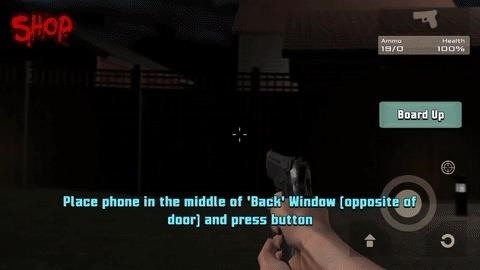 This sets the bounds of the game space and the points of ingress for zombies to invade, with the door and windows acting as portals to a virtual neighborhood. ARZombi is a first-person shooter, with your device's camera providing the viewpoint. Various weapons and tools, as well as their controls, are overlaid on this view. By default, your gun is drawn, with sights appearing in the center of the screen and a trigger button to the right. 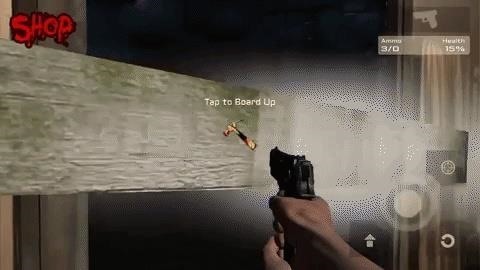 When your ammo is depleted, a spiked club is armed instead. When standing in front of door or window, a hammer appears, and players are tasked with tapping the screen to nail boards across the opening. However, it is a little rough around the edges. In the version of the game I played, the world tracking became wildly inaccurate at times, with zombies floating in mid-air instead of walking along the floor. A spokesperson admitted that this is a known issue, and the developers hoping to have it fixed with a forthcoming update. There are other areas of the UI that could use some spit and polish. For instance, there is an unskippable tutorial on how to set up the door and windows that I don't need to see everytime I start the game. Also, the health meter is shown as a percentage instead of a standard health bar. The game also has some difficulty setting boundaries for rooms (or, in my case, the first floor of the house) that are not perfect squares or rectangles. Without getting into too many specifics, the floorplan for the first floor of my house looks like an uppercase Q and C smooshed together. Because of the configuration, the zombies are not always occluded by walls as they should be. At times, the doors and windows would not anchor in the right locations. I consider these shortcomings of the platform, though. If ARKit were able to detect walls, this probably would not be an issue. Despite its flaws, the game has a modest enough price tag ($0.99) to merit an install, particularly for fans for first-person shooters and the horror genre.